Are you looking for a front entry door for sale in Houston? Finding exterior doors at a reduced price can help many afford the door of their dreams. Your front door sets the tone for your entire home, making it important to find one you love. The best way to find the perfect door is to take your time when you shop. Be sure to ask questions of each retailer you visit. You should also take a few moments and ask yourself a few important questions. There is so much choice that shopping for an entry door in Houston can be overwhelming. Taking the time to reflect on your home’s style, and your own tastes, will help. Asking yourself the following questions will help lead you to the right door for your home. It is always easier to have an idea of the perfect door in mind before you start shopping. Once you have asked yourself the following questions, visit Southern Front. They have a wide selection of exterior and interior doors in Houston. Southern Front is also happy to ship to locations across the U.S. and Canada. You can find the perfect door regardless of your location. Interested consumers can visit Southern Front online at http://www.southernfront.com. You can also contact them by calling 281-890-5860. If you cannot find the door you love, ask about custom models. Southern Front wants to be sure you go home with the door of your dreams. Asking these questions can be a great start. Why Style Of Entry Doors In Houston Look Best? Asking yourself which styles of entry doors in Houston you like best is a great start. This can help you narrow down your search, which may save you time. There are a few styles of entry doors that are popular in modern exterior design. Doors with sidelights, glass panels, and made with wood or fiberglass are the most common. These doors are usually easy to care for and keep clean. They are also known to be durable and available in a variety of shades and patterns. You should also keep an eye out for styles you dislike. Sometimes figuring out why you hate a particular style can guide you to one you do like. For example, if solid wood is too dark, you may prefer doors with glass inserts. You may also want to consider finding a retailer that provides custom options. This way you can combine elements of styles you like. 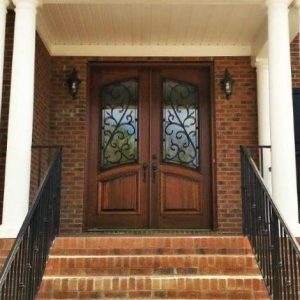 Start your search by browsing Southern Front’s wide selection of doors. You can view their products in store or online at http://www.southernfront.com. If custom choices interest you, contact them by calling 281-890-5860. Southern Front wants you to find the perfect door for your home. Contact them today to find out how. Do You Also Need Interior Doors In Houston? Are you completing a major home renovation? Does your renovation include replacing your interior doors in Houston? One way to achieve a uniform look in your home is to buy complimentary doors. Your interior and exterior doors do not need to match, but the styles should complement one another. The best way to do this is to buy everything from the same place. If you are considering custom options for both inside and out, you should buy from the same company. This way you can avoid the risk of the decorative touches clashing with one another. It is also much easier for you to have one point of contact for all your door needs. If you have thought about replacing your interior doors, this might be the ideal time to do so. Southern Front Stained Glass and Doors has many interior doors for consumers to view. You can take a look at their entire catalogue online by visiting http://www.southernfornt.com. Their interior doors come in similar patterns and styles as their exterior ones. This makes it easy to select the perfect doors for your whole home renovation. If you do not find a style you love, contact them and ask about custom solutions. You can reach Southern Front by calling 281-890-5860. How Can You Avoid Buying Cheap Exterior Wood Doors? Everyone loves a deal, but be cautious when you come across cheap exterior wood doors. Doors make with cheap materials do not last as long. They often warp and rot well before they should. As a result, you may wind up spending more money over time on replacement doors. When shopping for doors, avoid looking at cost alone. Instead focus on the cost as well as the materials used. This can help you avoid buying an inferior door. Cheap doors are also often sold by disreputable companies. These businesses may not give you all the information you need. In other cases, they may sell you subpar parts without offering long-term support. Buying something cheap will almost always cost you more in the long run. Avoid falling victim to these types of companies by researching the retailer in advance. Read their website with care and look up reviews. Look for a company that has affiliations with local homebuilder’s associations. These tips will help you find a retailer you can trust. Consumers looking for entry doors should visit Southern Front first. Southern Front has a wide selection of interior and exterior doors available. You can view their products online by visiting http://www.southernfront.com. If you do not find a style you love, contact them to ask about custom options. You can reach Southern Front by calling 281-890-5860. There are quite a few things you need to keep in mind when shopping for entry doors in Houston. It is easy to feel overwhelmed by the vast selection and number of retailers. Avoid wasting your time by asking yourself a few important questions. These questions will help you find a door you love. Almost as important, these questions will also help you find a door that will last. You can start your search for affordable front doors at Southern Front. Southern Front sells high quality interior and exterior doors at affordable prices. You do not need to compromise quality for cost when shopping at Southern Front. Take a look at their product catalogue online by visiting http://www.southernfront.com. If you want to discuss custom options, you can call 281-890-5860. Consumers looking for front entry doors for sale in Houston should visit Southern Front today.